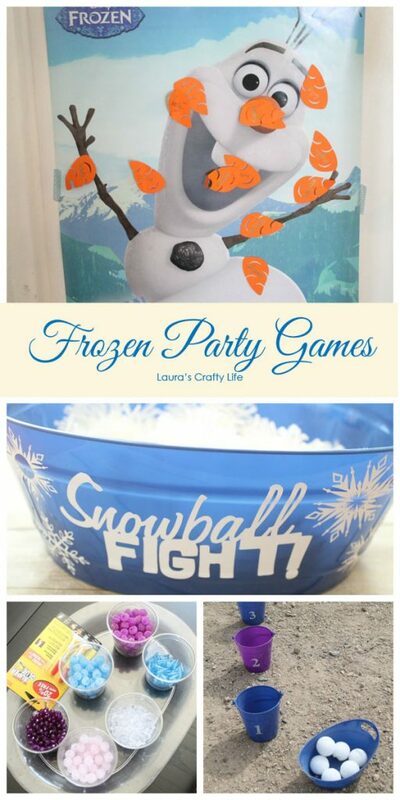 For my daughter’s party, I came up with a few fun Frozen party games to play with all the kids. Every year we do a piñata and some version of pin the tail on the donkey. Beyond that, I like to come up with a few ideas of other things for the kids to do in addition to those two games that fit within the theme of the party. First up, I created a bracelet making station. 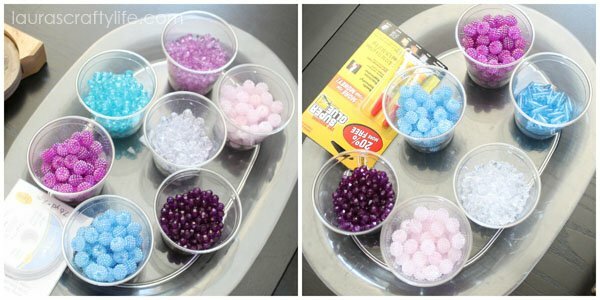 I purchased bead supplies from Consumer Crafts in various blue, purple and clear Frozen-themed colors. I also bought some of the elastic bead string for the kids to use to create their bracelets. 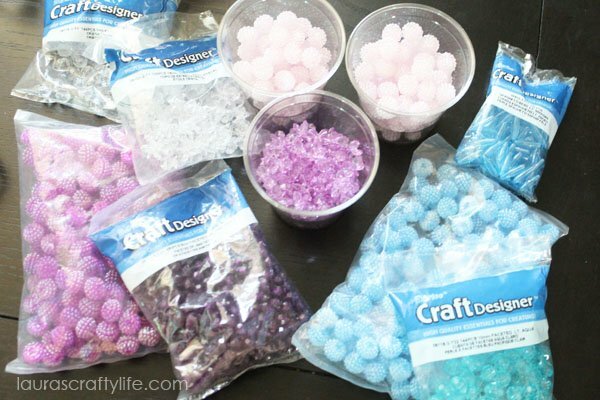 I set up two trays filled with beads separated into plastic cups. Note: Be sure when you tie the knots on the bracelet to tie them very tight. Then dab a little super glue on the knot and allow to dry. You can find small, one time use super glues at Dollar Tree. I believe they come with two little tubes per package. 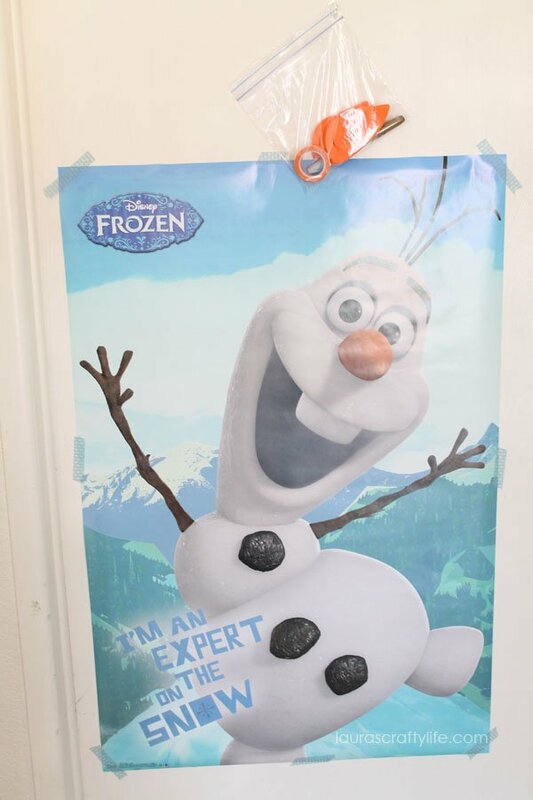 I purchased an Olaf poster at Walmart for around $5. 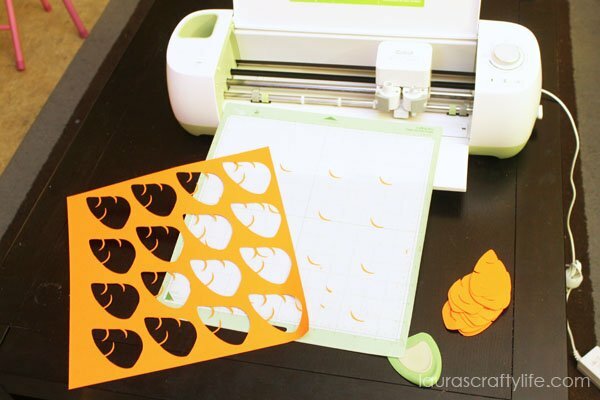 I then used my Cricut Explore™ to cut out Olaf carrot noses from orange card stock. I put the noses, some orange washi tape and a Sharpie for labeling the names on the noses when it came time to play the game into a small ziploc bag. This is always a fun game to play! And you can really adapt it to almost any party theme. We had a couple kids get the nose right on Olaf! I had no idea what the weather was going to be like at my daughter’s party. Her birthday is mid-January. In the past, we have had beautiful weather where we could all be outside and we have had cold, rainy or even snowy weather for her party. So, I made sure we had some activities to do inside. Note: I would not recommend playing this outside unless you have grass or something other than dirt in your backyard. I had to throw out all the snowball pom poms after the party because they were so trashed! 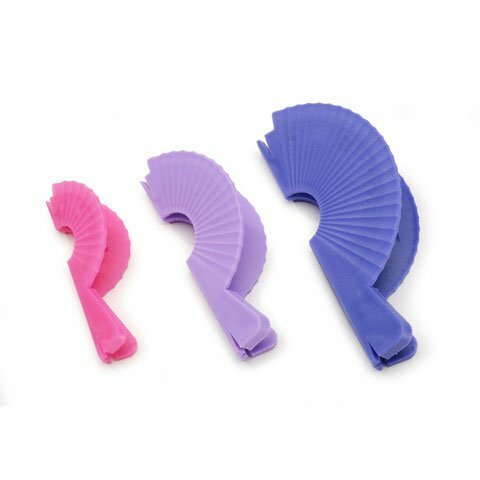 I purchased a pom pom maker from Consumer Crafts. I used the largest plastic loom to create my pom poms. 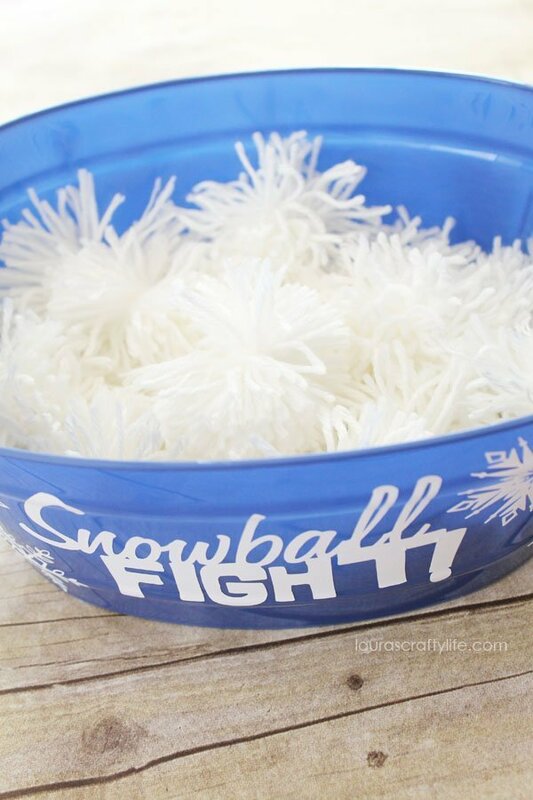 It is really easy to use and I whipped up 20 white pom poms in no time! I created a vinyl label for the bucket using my Cricut Explore™. 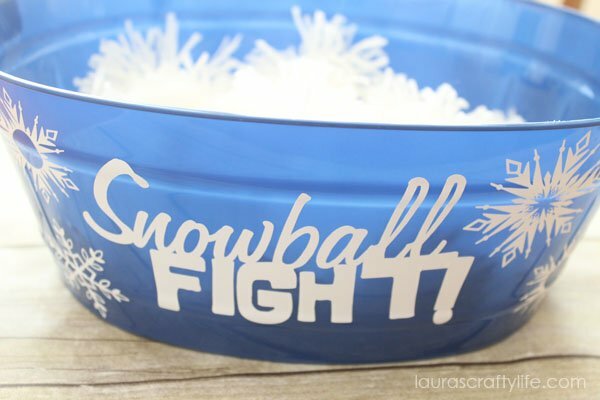 The snowball fight wording was a pre-designed image I found in Cricut Design Space™. The snowflakes were various ones from the Frozen cartridge I had purchased. When using vinyl it is always a good idea to use transfer tape to apply your cut images and words. It makes the application go much smoother and you have more control in placing your design without messing it up. I also had another snowball game planned for if we were able to go outside. I purchased small styrofoam balls that were the perfect size for little hands and looked like little snowballs. 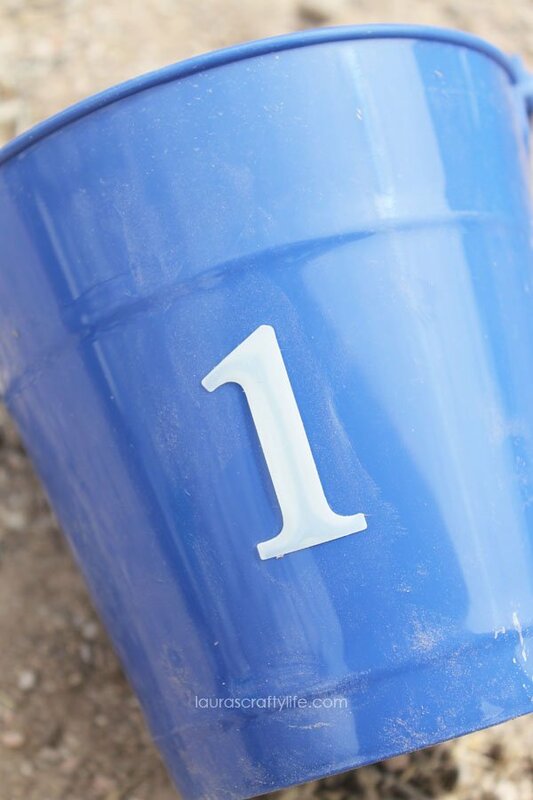 I got some small buckets from Dollar Tree that I labeled with number stickers. This game is pretty simple. 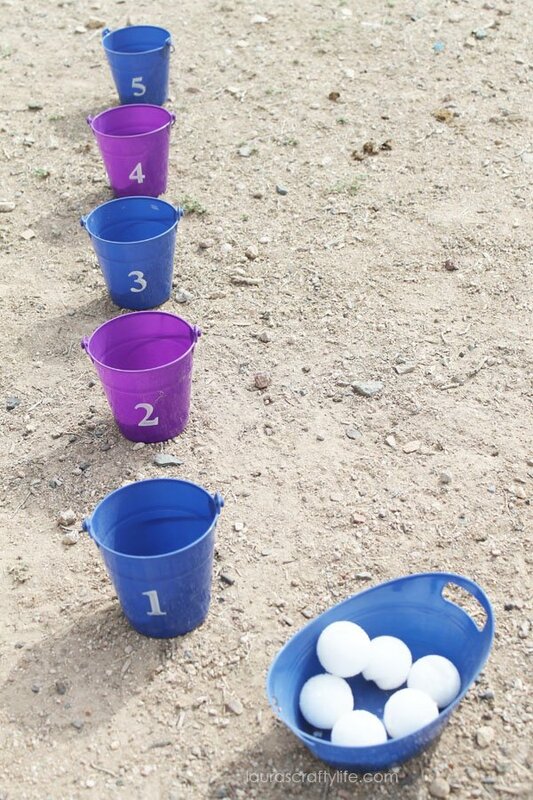 Just toss the styrofoam balls into the bucket. 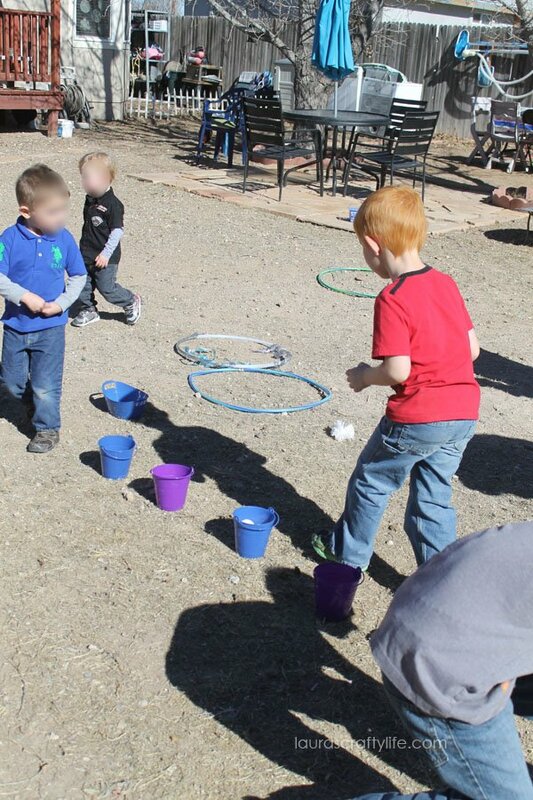 The goal is to try to get the ball into the furthest away bucket with the number 5 on it. 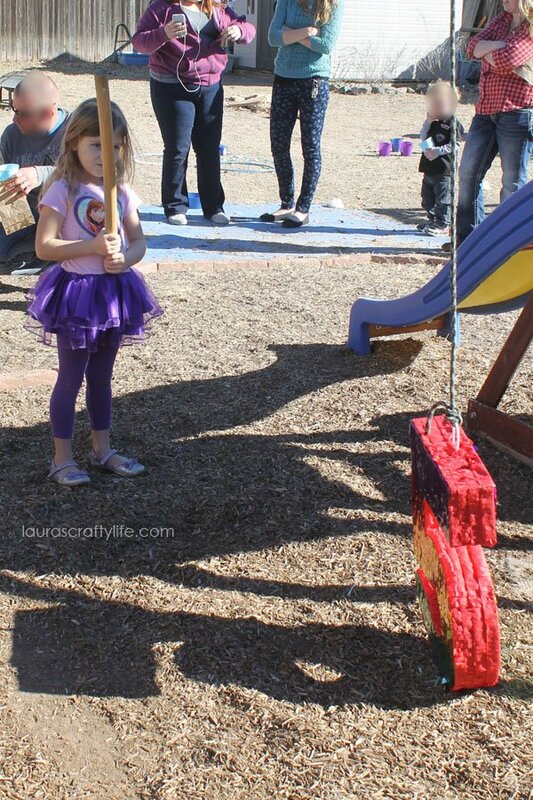 Last, but not least, every party we do we have a piñata. If I can get a good deal on a character one, I will. 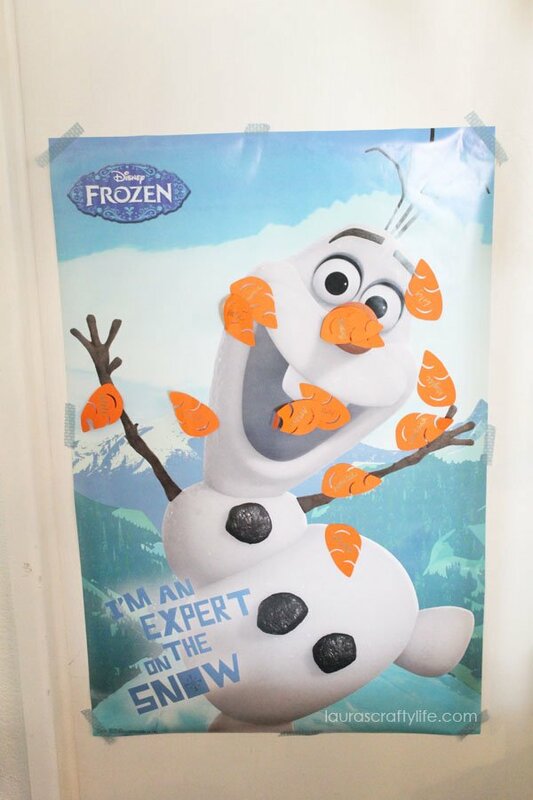 But this time I could not find a Frozen one under $20. So, instead, I purchased a less expensive number five piñata. Since it is just getting smashed to bits and I have to purchase candy to fill it, I don’t usually spend too much time or money on the actual piñata anymore. 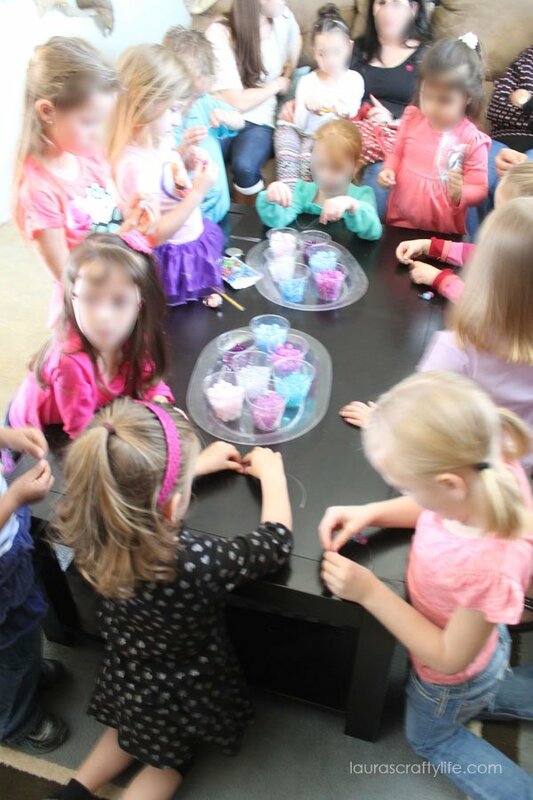 So tell me, are there any go to games you do at birthday parties?